Mission: To provide leadership and education to Missourians in the area of juvenile justice and ensuring the safety and well being of all youth, their families, and communities. JJAG envisions an environment in Missouri that helps all youth achieve their full potential, including maintenance of a separate juvenile justice system that balances justice for all juveniles with protection of all Missourians. JJAG endorses prevention, treatment, and the use of appropriate interventions necessary to promote public safety and youth development. Function: JJAG serves as the conduit for federal funding for state and local treatment and prevention services. 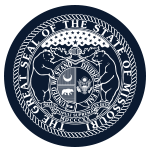 In addition to serving the specific needs of Missouri, JJAG is available to assist the Governor and the Missouri Department of Public Safety, which is designated as the state agency to meet and maintain compliance with the Juvenile Justice and Delinquency Prevention Act of 1974, as amended. Member Requirements: At least one-fifth of members must be youth that are under age 24 at the time of appointment. Three members must have been or are currently under the jurisdiction of the juvenile justice system; majority, including the chair, is not to be full-time employees of the federal, state, or local government. Members are to have training, experience, or special knowledge concerning the prevention and treatment of juvenile delinquency or the administration of juvenile justice.